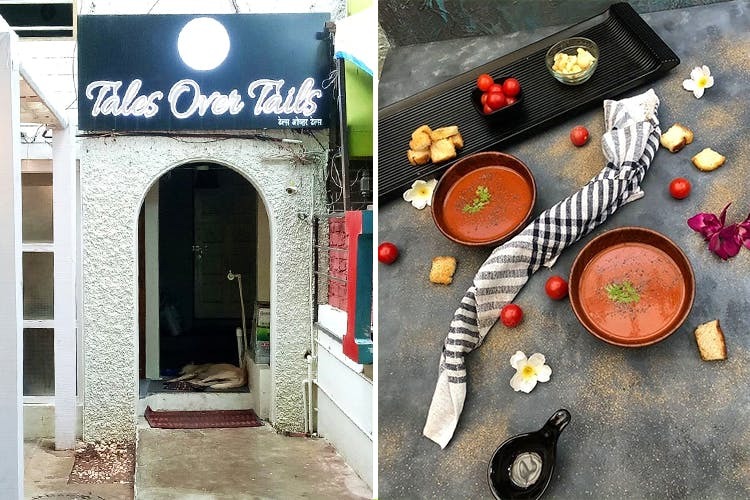 Tales Over Tails Cafe Bistro is the newest cafe in town which while being budget-friendly, is perfect for your next date with bae or a lazy Sunday brunch with your pets. A quaint little cafe, Tales Over Tails Cafe Bistro in Viman Nagar serves delicious multi-cuisine grub and also has an all-day-breakfast menu. The decor is minimal and quite sophisticated with comfy couches and chairs. The cafe has indoor as well as outdoor seating options. The menu has global fusion-food, but the highlight is that the cafe serves numerous gluten-free and vegan options. We recommend you to try the gluten-free juicy chicken pizza and the veggie schezwan maggie, which are utterly delicious. Our all-time-favorite oreo shake is also an absolute winner.Tales Over Tails is a pet-friendly cafe, so you can bring along your 4-legged companion and bond over great food. And while you await your food, you can pass time by playing the various board games available at the cafe. we hear they serve delicious vegan food. So, try their vegan options all the while slurping on their indulgent hot chocolate shots, all at an affordable price.